Literacy is an empowering skill and one that offers a whole new dimension of experiences. In 1972, a somewhat flawed and outdated literacy survey revealed that less than 1% of adults were completely illiterate. It worked out to roughly 330,000 adults or Wembley Stadium filled four times over; concern over these figures led to the launch of the Right to Read campaign. The BBC got involved in this public awareness program in 1975 with On the Move. 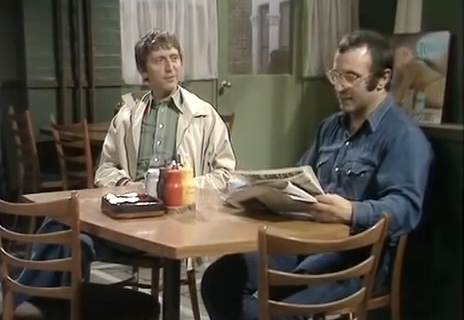 Alf (Bob Hoskins) is a removal man struggling to read and write, but between the laddish banter, he finds he can open up to his co-worker Bert (Donald Gee). Encouraged to face his anxieties, Alf begins to attend evening classes to combat his frustrating illiteracy. 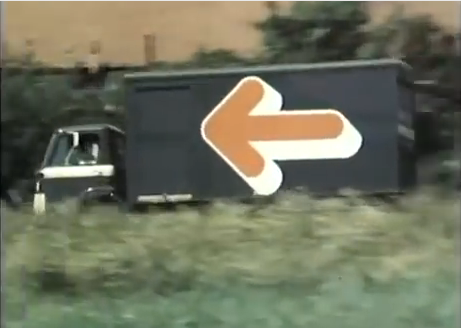 Every great TV show features a memorable vehicle and in this case Alf and Bert travel round in a black lorry with, uh, a big orange arrow on it. Interstitial segments feature Martin Shaw, Nigel Stock and Patricia Hayes performing literary exercises and anecdotes to inspire people to seek help. Writing legend Barry Took weaved together the scripts for 50x ten-minute episodes which first aired between 1975 - 76 on BBC1's Sunday evening schedule. The titular theme tune to the show was by 70s pop-rockers The Dooleys and can be heard in full here. Repeats of On the Move continued until late 1978; two spin-off series continued the fight to improve literacy in Your Move and Write Away. 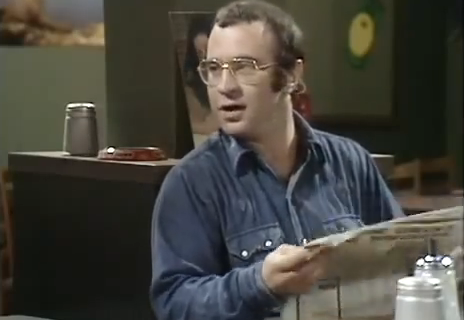 Featuring the late, great Bob Hoskins in one of his very first roles meant that On the Move was a show we couldn't pass on; after we found an episode on YouTube, we were delighted to discover that it was a charming little show far removed from the Open University's telly take on adult education. Bob Hoskins inhabits the everyman role of Alf in enthralling fashion and relays the message that no one, no matter how manly, should shy away from seeking help. Many comments on the YouTube video pay testament to Bob's performance encouraging them to confront their literacy which is probably the greatest compliment Bob could have expected. Donald Gee is unable to match Bob's depth here, but most telly actors of the time (or even the present day) would struggle opposite such a marvel. To our literate(ish) minds, we found the exercises presented fairly simple, but where else do you start? Simplicity is the key and learning from scratch the way forward. On the Move wasn't produced in order to solve literacy alone, but more to encourage people to seek help. George Auckland - future head of BBC adult education operations - remarks that it achieved this aim as "On the Monday after each episode, there would be queues around the block" to be found up and down the nation at literacy centres. From an amazing theme tune where you can almost taste the sunshine pouring out of it's harmonies, to Bob Hoskins' beguiling performance and topped off with a positive message, it's no surprise to learn that On the Move brought in 17 million viewers a week. Unfortunately, adult literacy still remains an issue, so perhaps it's time to instigate a similarly absorbing show. 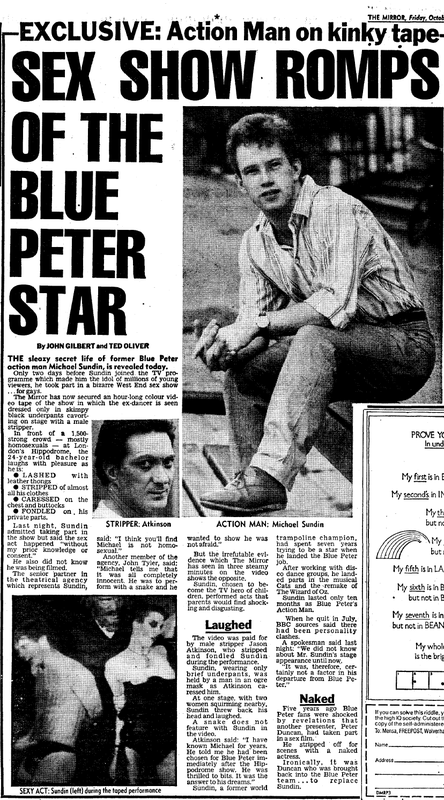 Michael Sundin died of an AIDS related illness on 23rd July 1989 just a few years after his Blue Peter career had ended in acrimony and tabloid accusations. The tragic backdrop against which Michael lived his last few years really piqued our interest. It's so at odds with the wholesome image of Blue Peter, but also raises the important question of whether people in the public eye are allowed private lives. We decided to take a look at the whole affair to see exactly what happened. Born 1st March 1961, in Gateshead; Tyne and Wear, to Alan and Joyce Sundin, Michael began to demonstrate his efforts as a performer by winning a myriad of trampolining awards. By 1976 Michael was able to boast the World Synchro Champion title which he captured with partner Carl Furrer in the 15 - 18 year old age group. However, Michael couldn't resist the throbbing heartbeat of disco and his natural talent for dance found him placing third in a national disco competition. The desire and passion bubbling inside Michael led him to forming his own dance group, Midnight Fantasy. Michael first started climbing the ladder, in 1980, when he appeared with Barbara Windsor in the pantomime, Jack and the Beanstalk, at the Theatre Royal, Newcastle. It was here that Michael was first talent spotted and, before he knew it, was wowing West End crowds as Bill Bailey in Cats; his performance in this role would prove to be pivotal in his turbulent future. Michael was spotted by Disney and considered for their upcoming film, Return to Oz. One of the most intriguing and iconic characters from Walt Disney's 1985 Return to Oz film was the mechanical man, Tik Tok. Somehow managing to contort his body to fit inside this squat, tin dome was Michael. Lyle Conway, creator of Tik Tok, illustrated just how dedicated Sundin was to his craft in an interview with Cinefex Magazine: "Michael was about five five and Tik Tok's about four foot. So Michael had to bend with his head between his legs, bolted in, and he did the actual walking around in the thing—backwards. Sometimes, in the morning, he wouldn't be able to fit; so it was just a matter of forcing him in. Then everything loosened up, and his body settled into it. When you took the suit off of him, this rush of hot air hit you and there were pools of sweat at the bottom of the thing". Little did Michael know that a chance piece of promotion for the film would lead him to securing a presenting role on one of British TVs biggest kids show. 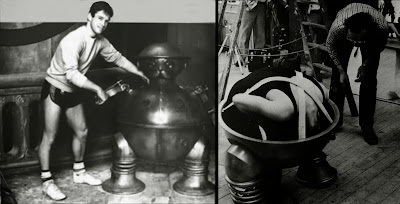 It was during the filming of Return to Oz that the Blue Peter team paid a visit to the studio and were impressed with the young Michael Sundin. Biddy Baxter, longtime editor of Blue Peter, decided to offer Michael an audition for the presenting role being vacated by Peter Duncan. By a stroke of luck, Michael's audition involved performing an interview on a trampoline. Michael was very different to previous male presenters in that he had a youthful vitality rather than the previous incarnates who seemed like a succession of geography teachers. Here were the blonde locks of a surfer coupled with the body of a gymnast - John Noakes he wasn't. Sundin appeared in a total of 77 episodes of Blue Peter between 13th September 1984 - 24th June 1985. This remains the shortest amount of time served by any Blue Peter presenter, not including stand in presenters Tony Hart, Anita West and Sandra Michaels during the 1960s. Michael's contract with Blue Peter was not renewed and this is where numerous, numerous stories have begun to circulate. Biddy Baxter has maintained that Michael was dropped due to his lack of popularity with viewers. Biddy wrote in her autobiography that "every post brought new evidence that Michael was getting a huge thumbs down". 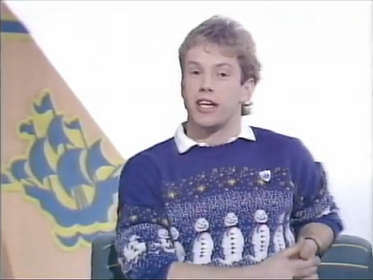 We've only watched a handful of clips of Michael's Blue Peter work, but we certainly didn't dislike him. However, his delivery is very wooden and he doesn't come across as natural in front of the cameras as his fellow presenters. Biddy goes on to state that "Sadly because of his voice and manner he came across as a whinger - and an effeminate whinger to boot". Is this the statement that confirms Michael was the victim of homophobia? No. 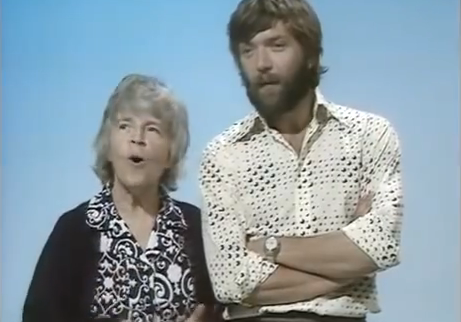 Sure, it's not fair to label being effeminate as a negative, God knows there were enough campy TV presenters in our youth, but it never bothered us. For Michael, though, things were about to get much worse. The 1980s were much a different age in which to be gay. The shame and horror that had previously been reserved for such behaviour was suddenly increased tenfold with the emergence of AIDS. Known for some time as the gay cancer, AIDS was the decade's bogeyman. The language of the piece is indicative of the public's attitude towards homosexuals at the time and the article must have been a crushing blow for Michael. However, he had left Blue Peter by this point, so the myth that this article caused him to be sacked is nothing more than conventional wisdom. Michael immediately rushed a statement out the following day which confirmed that he had a homosexual past, but this had been nothing more than a phase. This itself was a brave statement in a time when other public figures were far too scared to admit such a past. However, the damage had been done. Michael's career never really recovered from the scandal, but he did go on to appear in the 1987 film Lionheart and his final appearance was as a dancer in the Rick Astley music video She Wants To Dance With Me. In 1988 rumours began to surface that Michael was ill and on 26th July 1989 it was reported that he had died of liver cancer. It has since been revealed that his actual death was AIDS related. Was Michael Unfairly Treated by the BBC? After weighing up all the evidence we don't believe Michael was badly treated by the Beeb. Michael's main stumbling block was that his presenting style was below par and failed to engage and connect with the audience. The internet, as ever, is awash with rumours that so and so saw Michael at this and that gay club and the BBC were adamant this was no place for a children's TV presenter. It didn't help that Biddy Baxter described Michael as an "effeminate whinger", but this is more a poor choice of words rather than any homophobic smoking gun. Baxter has gone on to say that "his leaving the programme was to do with the fact that children didn't like him, nothing to do with his sexual proclivities". She also claimed that perhaps the gay angle does just make it a "better story". And this article is proof of that fact. Ultimately, in the AIDS hysteria of the day, there was no way back for Michael. As Richard Bacon found out a decade later, children's TV presenters are not entitled to a private life. They are, first and foremost, role models as defined by society's taste. Sadly, Michael Sundin was never able to fully voice his side of the story, so a definitive end is unlikely to be found.